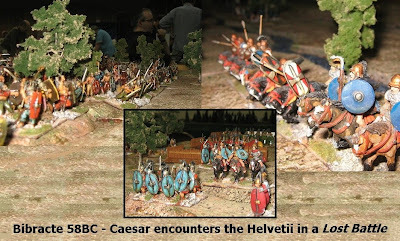 This year, Phil Sabin combined with Eric and Alan on Saturday for a Lost Battles interpretation of Caesar's enterprise at Bribracte. 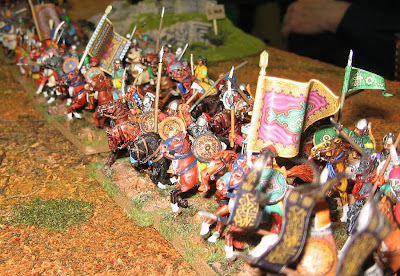 Doubling the value as ever, on Sunday, David Edwards and Kevin Large offered an AMW try out game, featuring a skirmish between Byzantine and Turks. Stalwarts from the Shows North crew travelled down both days to man the stand, joined by Daivid 'Championship' Barnsdale .... (RJC was busy winning the 28mm FoG competition, but popped over occasionally to update us). 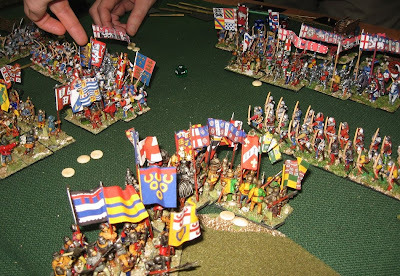 Graham Fordham was fluttering his flags in the same tournament, local veterans Duncan Head and Bob Robertson joined us for a chat and I had a penetrating debate about realism with FoG author Richard Bodley-Scott over lunch. Valuable networking and a sociable and useful weekend. I'll indulge a snippet or two from that chat as it has some themes that might be interesting ... the visitor was a recently 'ex-ed' ex-member who felt that Slingshot's recent attempts to cover 'everything' had resulted in it being thin on the main ancients game - which he thought was Field of Glory (because that's what everyone he knows now plays bar the half dozen or so DBMMers you see at competitions). He didn't really see the point of covering rules nobody uses (AMW, Armati, Impetus .. to name but three ...)...Now, I'm not repeating this to be argumentative (as I indicated at the time, since my locals don't play FoG or DBMM, but do play Armati and AMW, generalisations just do not apply) ... I make it because it touches on perceptions. 118 players played ancient/medieval at this year's Britcon ...just over 300 names appear on the FoG tournament rankings list (though many have only played one event): maybe regular ancients 'tournament players' in the UK generally constitutes around 200 wargamers? So about 1/5 the size of Slingshot's UK readership ... just as ancients enthusiasts are a minority of wargamers, tournament players are an even smaller minority of the ancients fraternity. For example at Salute this year there was a whole host of ancients games - none of them played using FoG. On the other hand, at Reading, on the competition tables, it looked more like about 80% FoG. Very different proportions of very different games. To have extrapolated from either, on its own, what most people did would clearly have been a mistake. Unfortunately, within wargaming, there are no real statistics or surveys upon which to build anything other than a summary of unrepresentative opinions ... Sales of publications such as Field of Glory far exceed membership of clubs like ours (and sometimes this can lead authors/publishers to jump to conclusions about relative value or popularity ... but I see far more mint copies of FoG booklets on the Bring & Buy than Slingshot, so I wouldn't read much into it). 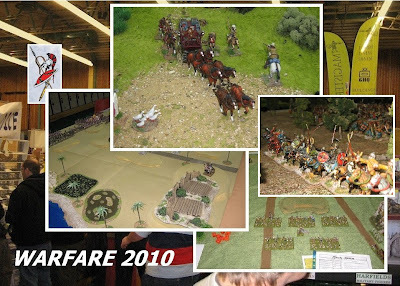 Statistics apart, I do think it a pity when historical wargaming and tournament wargaming diverge to the extent that they have. I do think it a pity that the games newcomers can try amongst the display and participation tables are so blatantly not the games being played on all the tournament tables. Sometimes I think the tournament players are seeking a purer test of gaming ability, the display gamers are showing off their overblown collections and the participation tables looking to garner players by offering a cheap thrill ... that is, sometimes I think we are all getting it wrong. 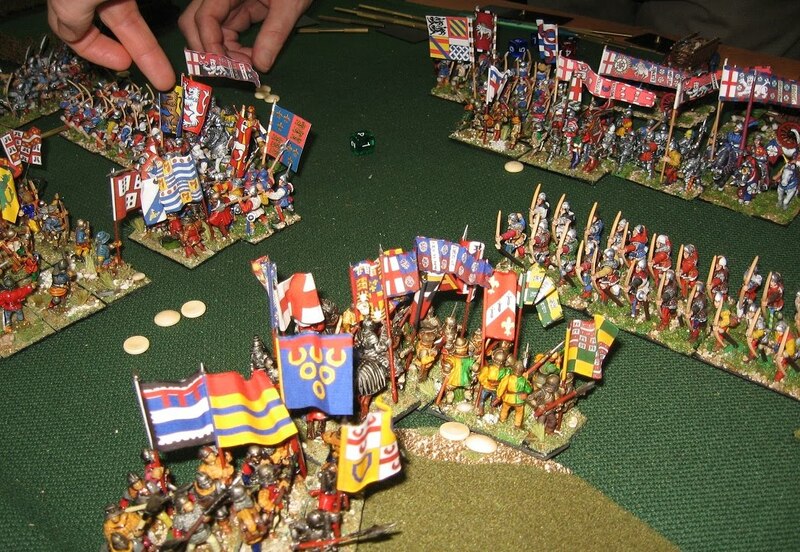 As it goes, we did very well from Warfare, gaining quite a number of new recruits by the end of the weekend. 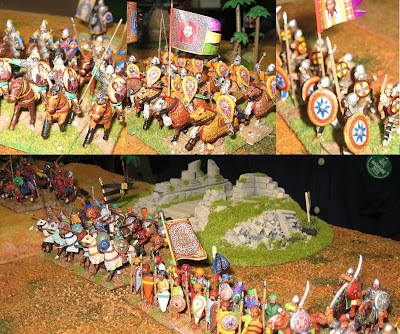 Through the games and publications scheme, a number of non-members left with a chance to explore ancient a medieval topics the Society of Ancients way. Good stuff. Thanks to everyone who stopped by ... whether with compliments or problems which need fixing, all are appreciated.Someone came over just to ask me to pass on his thanks to the SoA team for all the work we do ... he thought it marvellous that we could achieve it all just on volunteer input. Well, I guess it is - and consider it done! Good post... 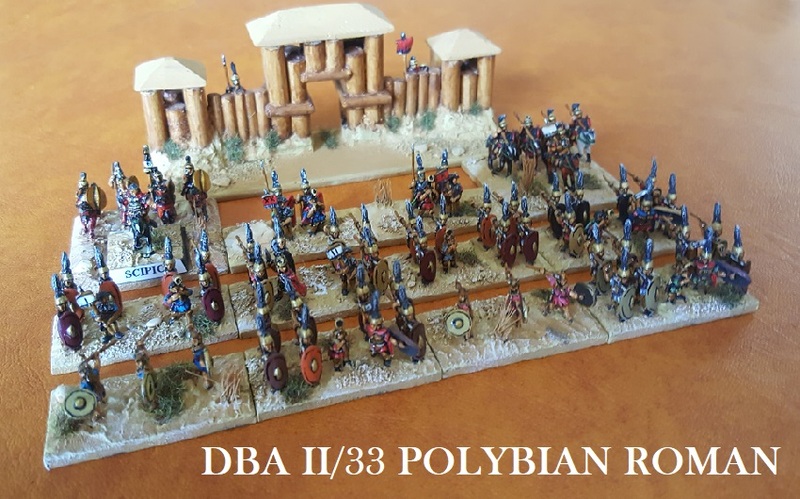 I did spot you table on Saturday but not being a member I neglected to have a browse (not really an Ancients player other than the occasional game of DBA), to be fair though I am a member of the Pike and Shot Society and I didn't say hello there either!! Interesting that you didn't mention Warhammer Ancients - is that not de rigeur?? 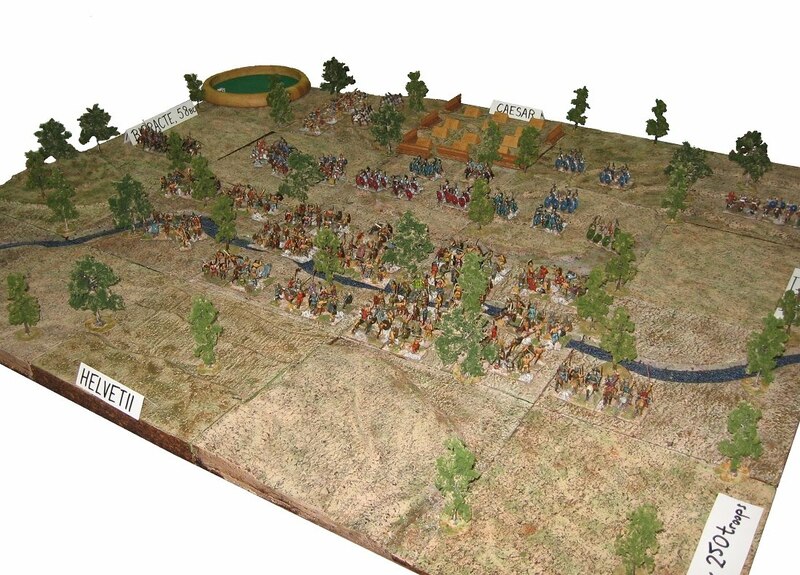 If I'd been asked to guess the most popular set of Ancients rules that would have been it... or is that "AMW"? 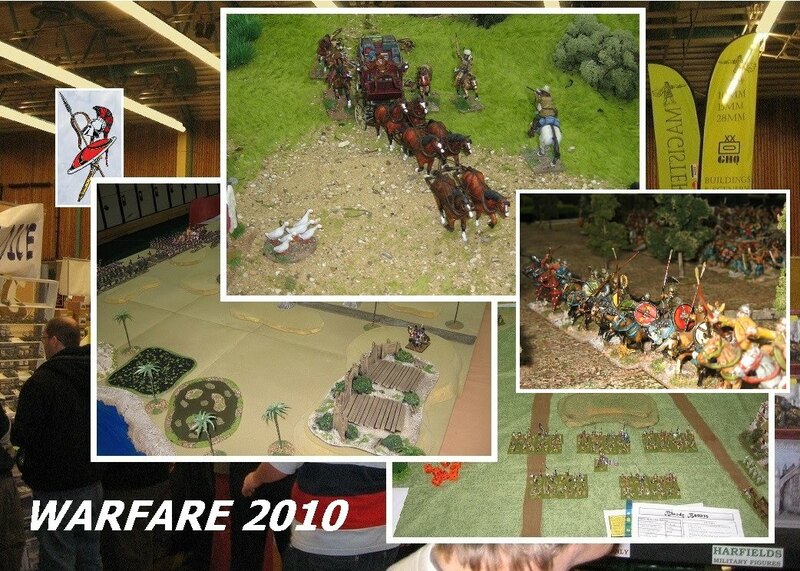 I didn't mention Warhammer Ancient Battles as it doesn't fit the mould either. I agree, it might well be the most popular. Actually, the guy chatting to me on the stand didn't include it in his comment at all. With a smile I might add that WAB must be de rigeur as Adrian Goldsworthy favours it!